We have added new flavors and toppings to a dish that has been feeding people for hundreds of years. Pizza and pizza toppings have come a long way since the tomato was added around 300 years ago. 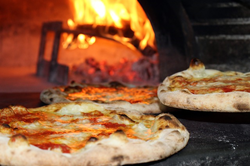 Even though there are pizza-purists who cling to the idea that marinara and the margherita are only true pizzas public taste certainly has other ideas. Hawaiian pizza may have marked the beginning of pizza topping innovations. Even though marinara and margherita pizzas are still standards, Marv’s the Paso Robles pizza restaurant, continues innovative and original recipes that include traditional pizza and Barbeque Chicken, Tri-Tip and Green Chili, Gourmet Chicken and Bacon and Garlic Delight to name a few. Marv’s Original Pizza menu is not limited to pizza. Pasta dishes and Italian-influenced sandwiches such as the Meatball Sandwich and the Chicken Parmigiana Sandwich plus a special kid’s menu help create take-out or eat-in dining experiences for everyone’s taste. Paso Robles, a favorite wine country and dining destination for travelers from around the world, is located on California’s Central Coast with easy access from Highway 101, about half way between Los Angeles and San Francisco. Be sure to drop into Marv’s Original Pizza when in town. Highly rated on both Yelp and TripAdvisor, a visit to Marv’s is on the “must visit” list.